This is probably the easiest one for people to understand and see. 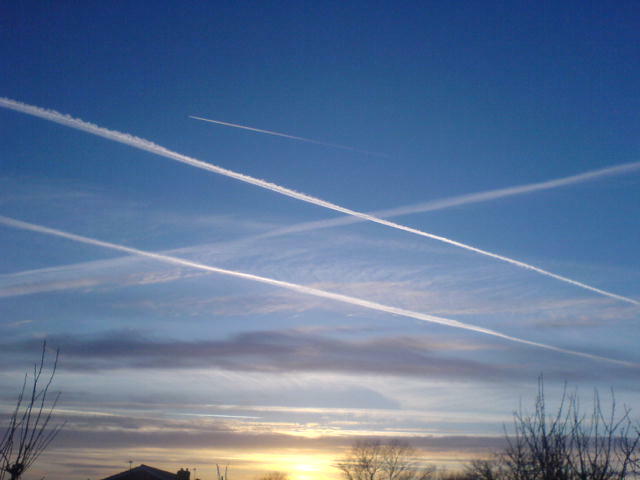 Those crazy jet exhaust lines that you see in the sky, like giant grid patterns over cities….thats them. 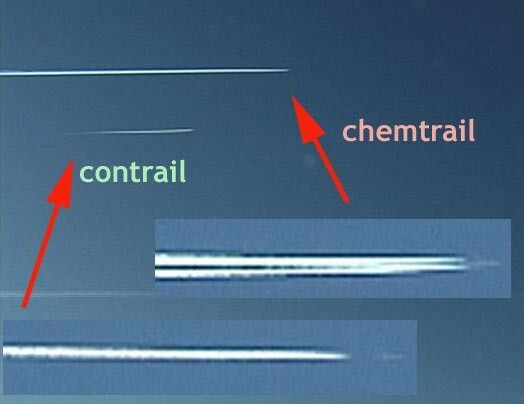 Here we look at the difference between “chemtrails” vs “contrails,” and take a look at who all is involved in creating them. The purpose of why they create them is a rabbit hole in and of itself that we will also touch on. 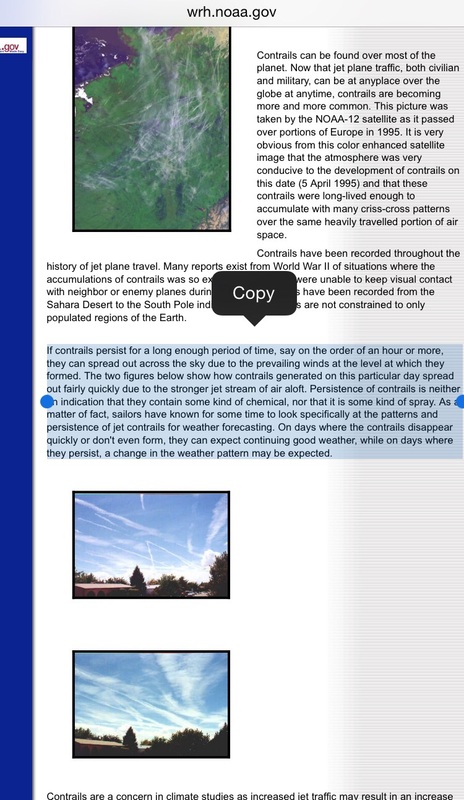 Scroll down and lets talk about jet chemtrails. So you’ve seen the trails, and heard your conspiracy theorist friends yack about them…but what ARE they really?? Well, it seems that since the late 1990’s, the military jets have been combining fuel additives to their fuel tanks, and when they want to, they can flip a switch and utilize these additives to change their airplane exhaust trail. A normal exhaust trail from a military jet is called a “condensation trail,” because the hot exhaust condensates into gas upon arrival in the cold dry air. 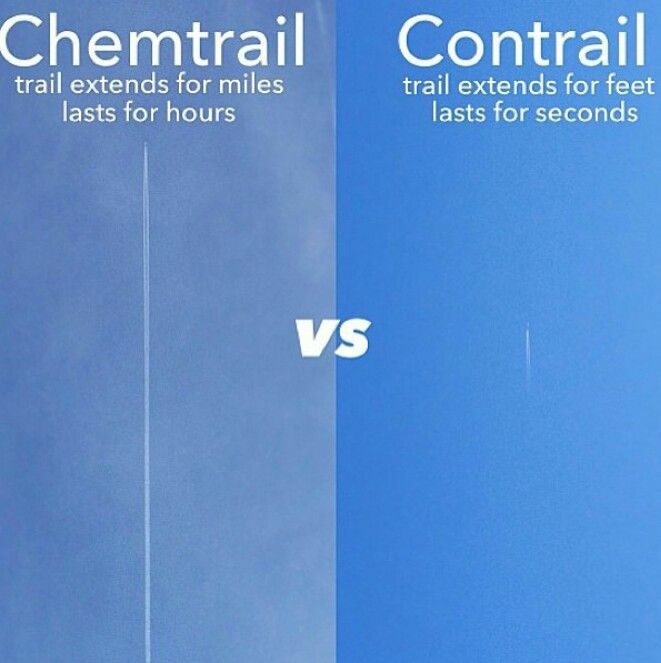 Condensation trails(aka ‘contrails’) then disappear within seconds, leaving the sky blue. Chemical trails on the other hand leave a distinct exhaust trail in the sky that lingers for 30 minutes to an hour as it grows and expands in size. Notice the difference in the two photos. The chemtrail exhaust(artificial) lingers in the air while the contrail exhaust(normal) dissipates. What advantage would an exhaust that stays in the air have? And what exactly is IN that exhaust? 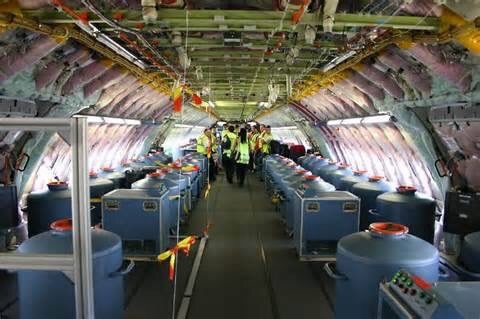 THE INTERIOR OF A CHEMTRAIL PLANE. THINK OF THE COSTS OF THIS PROGRAM! This entry was tagged chemtrails, georngineering, haarp, weather control. Bookmark the permalink. ← WELCOME TO SANITY IN AN INSANE WORLD.